Parts of All Saints date from the 12th century, but the church includes additions and alterations from the 13th, 14th and 15th centuries as well as later alterations down almost to the present day. By the mid 13th century, most of the Parish was owned by various monasteries, notably Lenton and Swineshead. Lenton Priory had jurisdiction over the church, which was rebuilt in stone and rededicated on All Saints Day,1246. 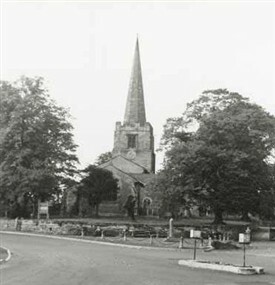 The church was once shared between two manors, and Cotgrave had the unusual distinction of having two rectors in one parish right up to 1659. During a plague outbreak in 1637, two men exiled themselves from their families, locked themselves into the church and used the building as the village food store. Food was placed on the church wall for people to collect, placing their money in a hollow Plague Stone filled with vinegar as disinfectant. The Plague Stone remains in the church today and still fulfils a useful purpose as a holy-water stoup. Repairs and renovations are known to have taken place in the 1840s and the 1870s. The church was badly damaged in a fire in 1996 and subsequently restored by the Architect John Cunnington.